The retreat will be led by Leanne Dagger and Inma Andres. We met during our Yoga Teacher Training with Yoga Quota and became friends through our mutual deep love for yoga. We both believe that yoga is for everyone and should be enjoyed by all, no matter their experience or needs. Creating a practice where every body feels welcome, where you can connect with yourself and celebrate everything that you are is what makes us happy. Leanne’s relationship with yoga began in 2007 as a way to find meaningful connection with her own body. In her Ashtanga practice she found a sense of peace and trust in her body. Later on, through the transition of pregnancy and parenthood Leanne maintained a more relaxed intuitive style. Today, she personally practises and teaches Vinyasa yoga to groups and individuals of all abilities and preferences across Warwickshire, England. Before training as a yoga teacher, Leanne was a Children’s Nurse specialising in Women’s and Children’s Health and Wellbeing. Her extensive training and clinical health practice informs her teaching, utilising her training in anatomy and physiology as a foundation. Following completion of Pregnancy, Post Natal and Mother and Baby Yoga Training with the wonderful Sally Parkes Yoga and Rainbow Kids Yoga, Leanne co-founded Balance & Bloom in 2017, a collaboration which aims to provide and support families to connect, engage and nurture through Baby Massage and Pregnancy, Baby, Children and Family Yoga. 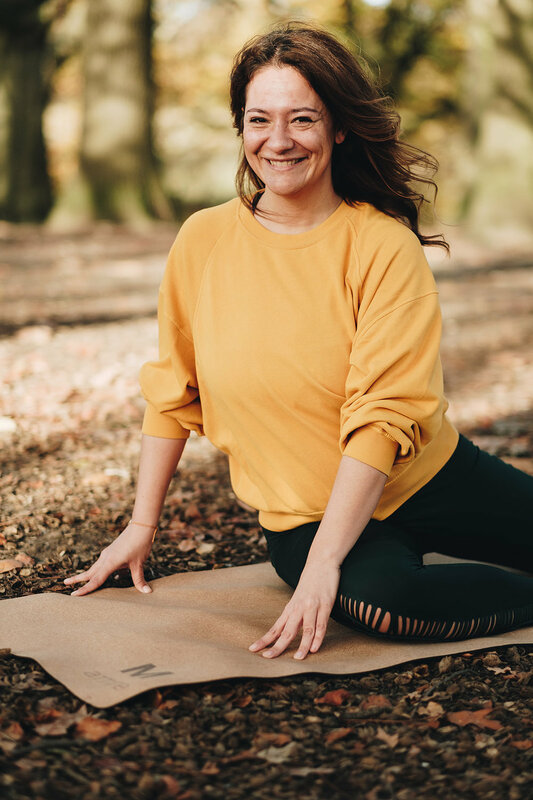 Leanne is a Yoga Alliance accredited, Registered yoga teacher and completed her 200h Yoga Teacher Training Programme with Yoga Quota, Oxford, and is an active member of this community offering free charity classes as part of the Yoga Quota Associate Badgeholder Programme. Building and sustaining a yoga community which is supportive and inclusive is very important to Leanne, enabling everyone to explore their own yoga practice in a welcoming environment. Inma’s yoga practice started ten years ago at home, with a DVD that was straight out of the 80s, but it was a few years later when it became a pillar in her life. As it happens for many people, this was during a very challenging time. Yoga became a self care ritual, a practice where as well as calm, she also found immense strength and resilience. In the following years she combined her passion for yoga and travel and went on yoga retreats to beautiful places like France, Spain, Bali or Cornwall. She always came back feeling amazing after a few day’s of yoga, nourishing healthy meals, time to herself and an opportunity to connect with other people and make new friends. It has always been a dream of hers to create that experience for others. After 14 years living in the UK, in early 2018 Inma moved to her native Spain to be closer to her family, where she teaches weekly Vinyasa and Yin classes for all levels. Inma is a Yoga Alliance accredited, Registered yoga teacher and completed her 200h Yoga Teacher Training Programme with Yoga Quota, Oxford.